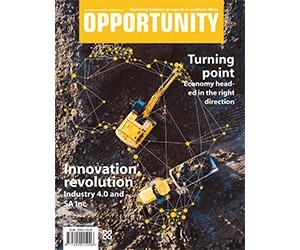 Opportunity magazine is a niche business-to-business publication that explores various investment opportunities within southern Africa’s economic sectors and looks to provide its readers with firsthand knowledge about South African business. It also looks to present South African business to international markets that may have interests in investing in South Africa. The publication is endorsed by the South African Chamber of Commerce and Industry.